New Web Address and E-mail! Looking for a New Gym?? What and who is Machine Shop Strength and Fitness? Machine Shop opened its doors over 8 1/2 years ago and was the first "box" then on the market. The owners and lead trainers, Angie McNally and Dean Eckel have over 31 years combined experience in the fitness sector. Both are Certified Personal Fitness Trainers, CanFit Pro Certified along with other specialty certificates and Olympic Trainer certificates. This training combined with years of experiences puts them in a league of their own. -Maximum of 12 people per class to ensure proper coaching. -All of our trainers have an educational background in fitness training and coaching. 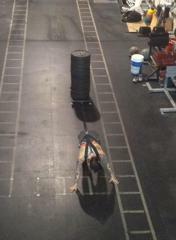 -Strongman equipment and skills used in our programming. 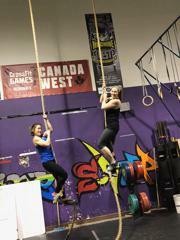 -Owner/Coach Angie McNally is an elite athlete who has made the CF Regionals in past years. -We don't require our "newbies" to purchase an expensive On Ramp or Fundamentals course in order to join any of our classes. In addition to regular Classes we also offer Free "Open gym" times and seasonal Bootcamp classes. Check out our class calendar for days and times. All of our classes are challenging and you never know what the coaches will add to the mix. But that doesn't mean that you have to be an elite athlete to come and join us... in fact most of our clientele are average joes just looking to have fun and ramp up their fitness regime. Some of our favorite add ins are things like running, flipping tires, box jumps, farmer carries, keg walks, sled push/pulls. There are many more options here are at the coaching teams disposal so come on out and try a Class today... 1st ones Free! No Theory just action and results! Did You Know You Can Start Today? Did you know you could start doing classes here at Machine Shop today or tomorrow? First class to always Free to newbies, all you have to do is e-mail us with the date and time of class that you would like to try so we can book you! This is the best way to know if its what you want and what you are looking for! Plus you get to meet us and we get to meet you and learn about your goals. The Machine Shop owners are the coaches and have over 31 years of combined experience working in the fitness industry and are capable of managing both current and new members in any Class. Check out these videos we did to help you understand the breakdowns of Muscle-up transitions for MU days in July! Muscle up Day(s) will be July 16th and 30th! Be sure to book into gymnastics class on these two days if you already have your strict pull-up and ring dip and we will get you working on the proper progressions and get you a muscle up by the end of Summer!! ©2019 Machine Shop / SportsEngine. All Rights Reserved.